A beautifully creamy, natural soap that looks and feels like melted chocolate! Naturally fragranced with earthy patchouli and spicy frankincense oil to energise, cleanse and condition. Made with a high content of shea butter, this rich, creamy soap is ideal for dry, sensitive and problem skin types. This authentic African Black Soap is traditionally handcrafted and fairly traded with Women’s co operatives in Ghana, West Africa. It is made with 50% pure, organically grown shea butter, palm oil and cocoa butter. The lye that is used in the saponification process, is made from the ash of cocoa pods. There are no chemicals, preservatives, colour enhancers or fragrances added to the recipe. The black colour of the soap is developed as a result of the saponification process which it undergoes. It is completely free from black dyes and charcoal. African Black Soap (Saponifed Wildcrafted Virgin Shea Butter, Coconut Oil, Palm Oil & Cocoa Butter)*, Organic Rosewater (Rosa damascena). *Wildcrafted, fairly traded & sustainably harvested. Our Liquid African Black Soap has a wonderful creamy lather and leaves the skin feeling moisturised and soft. It looks a bit like melted chocolate! It is one of the healthiest soaps for the skin due to the purity and simplicity of the ingredients. We craft our liquid black soap with organic rosewater for optimum skincare benefits. Rosewater is a skin tonic in it’s own right and can help to settle aggravated, irritated skin. This combination makes it a fantastic facial soap and it is helpful for dry, sensitive or problem skin types. It makes a great body soap and we love using it from top to toe. There are no chemicals, preservatives, colour enhancers or fragrances added to this recipe. The dark colour of the soap is developed as a result of the saponification process. It is completely free from black dyes and charcoal. 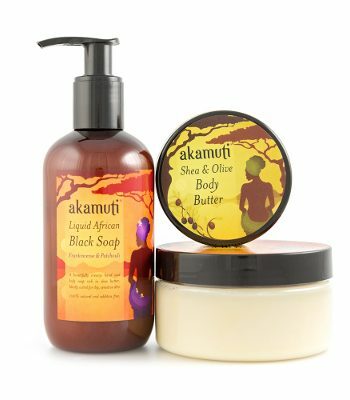 The African Black Soap used in this product is traditionally hand crafted and fairly traded with producers in Ghana, West Africa. It is made with 50% pure, organically grown shea butter and wildcrafted palm oil. Our authentic African black soap is sourced from a women’s project in Ghana,West Africa. They produce environmentally friendly and socially responsible African products, such as organic shea butter. The black soap project enables thousands of Ghanaian women to supply an international market with their produce. Supporting such projects facilitates the protection of trees, for example; the shea parklands in the Western Savannah. It also preserves biodiversity and the natural habitats for hippopotamus living by the Black Volta River. So much love! Love this product more than any other soap I have tried, the only natural soap that doesn’t dry up my eczema, or my scalp. Can’t beat the smell either! I recommend this to everyone I know, a must buy!! I use this every day as an all over wash, including my hair. It doesn’t leave my scalp tight like some shampoos, my hair is clean, soft and lightly scented, as is the rest of me. I love it. I use this daily on my body and after only a few uses my skin is already looking brighter, not bleached lighter, but has a nice glow to it, hence I’m hoping in the next couple of months it starts to fade away my old scar marks. As a shampoo, on 4b / 4c hair the moisture level is amazing lol ? Hence, I will use this after a protein type treatment , as otherwise my hair will become to mushy soft! Also I found this one to spicy fragrant for my face, hence I only use the unscented variant on my face area. I use this for my hands and my body when I take showers and baths. It works great for both. It’s a first for me not to have dry skin after using soap (detergent in actuality). I also use this as a face wash prior to applying a face moisturiser and I love how gentle it is. My face would act out crazy and blow out with zits if I used store-bought “soap”. It’s not really necessary though to use soap on your face everyday so I just use it once in a while because water is gentler than even the most gentle soap. That’s a thing to keep in mind. My skin looks best when I pay attention to if it really needs a deep cleansing or not. Usually I find soap too drying and shower gel is full of added nasties. This soap is the answer. It cleanses beautifully without leaving my skin feeling dry and tight. I will never go back to regular soap or shower gel again.